LANSING (JUNE 6, 2018) — Candidates and the groups that want to help get them elected have aired more than $4 million in broadcast TV ads in Michigan so far this year. 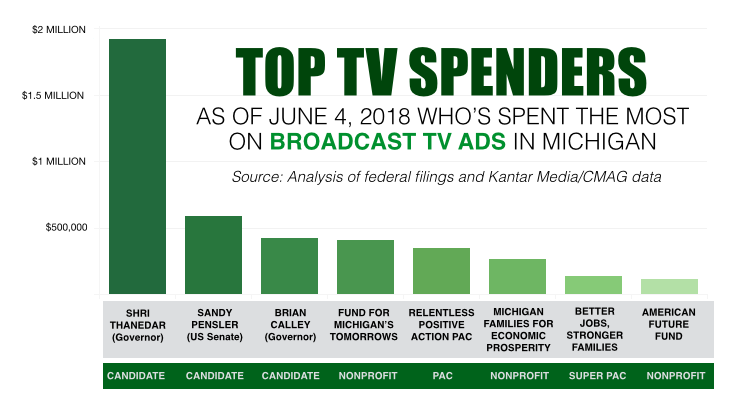 As of Monday, June 4, Michigan voters had viewed an estimated $4.45 million in political ads on broadcast TV in 2018, according to the Michigan Campaign Finance Network’s analysis of Kantar Media/CMAG ad-tracking data and Federal Communications Commission filings. The total does not include spending on cable TV ads and social media ads, which are more difficult to track but have seen heavy spending from candidates and groups this year. There are still two months before the Aug. 7 primary election and five months before the Nov. 6 general election. This year, Michigan voters will select a new governor, a new attorney general and a new secretary of state. They’ll also select a U.S. senator, fill two seats on the Michigan Supreme Court and choose candidates for all 148 seats in the state Legislature. The top spender on ads so far in 2018 has been Democrat Shri Thanedar, a businessman from Ann Arbor who's running for govenror. As of the end of 2017, Thanedar had given his own campaign $5.9 million, according to campaign finance disclosures. It’s a campaign that has aired an estimated $1.91 million in broadcast TV ads as of June 4. He’s heavily out-spent his two main competitors for the Democratic nomination. Former Senate Minority Leader Gretchen Whitmer hasn’t aired any broadcast ads so far. Former Detroit Health Director Abdul El-Sayed has aired about $35,000 in broadcast ads. On the Republican side, three of the four candidates for governor have aired broadcast TV ads. A handful of outside groups are also airing ads about the GOP candidates. Lt. Gov. Brian Calley’s campaign has aired an estimated $421,000 in broadcast TV ads. Two PACs that support him have also been active. Gov. Rick Snyder’s Relentless Positive Action PAC has aired an estimated $343,000 in broadcast ads, and Calley Continues the Comeback, a Super PAC, has about $63,000 in broadcast ads. The Super PAC has also been active on cable TV. Both the Relentless Positive Action PAC and Calley Continues the Comeback can accept unlimited contributions but are supposed to act independently of Calley’s campaign. Relentless Positive Action PAC’s top donors have been Roger Penske of the Penske Corporation, who gave $250,000 and William Parfet, former CEO of MPI Research, who gave $100,000. Calley Continues the Comeback has received $250,000 from Parfet, $250,000 from T.E. Adderley of Kelly Services and $200,000 from Daniel DeVos of DP Fox Ventures. Attorney General Bill Schuette’s campaign has aired about $76,000 in broadcast TV ads. But a nonprofit and a Super PAC that support him have been heavier spenders. The social welfare organization Fund for Michigan’s Tomorrows doesn’t have to disclose its donors and has aired about $408,000 in broadcast ads. It’s been the top non-candidate ad spender so far in Michigan. The Super PAC, Better Jobs, Stronger Families, has aired about $136,000 in broadcast ads. Its top donors have been Kojaian Properties Inc., which gave $250,000, Oakland Financial Corporation, connected to the Moroun family, which gave $250,000, and Peter Karmanos of MadDog Technology, who gave $250,000. Dr. Jim Hines, of Saginaw, has aired about $5,000 in broadcast TV ads so far. The fourth GOP candidate for governor, state Sen. Patrick Colbeck, hasn’t aired any broadcast TV ads at this point, according to MCFN’s tracking. Republican Sandy Pensler, a businessman from Grosse Pointe, has been the lone U.S. Senate candidate airing broadcast TV ads in Michigan so far, according to MCFN's tracking. His campaign has aired about $587,000 in broadcast TV ads. He’s also aired many ads on cable TV. According to campaign finance disclosure, Pensler has loaned his own Senate campaign $5 million. Pensler is competing for the GOP nomination for U.S. Senate with Detroit businessman John James. Both candidates want to challenge incumbent U.S. Sen. Debbie Stabenow, a Democrat from Lansing, in the fall. Three other nonprofit organizations that don’t have to disclose their donors have been active on the TV screens in Michigan. Michigan Families for Economic Prosperity has focused on criticizing U.S. Reps. Mike Bishop, a Republican from Rochester, and Fred Upton, a Republican from St. Joseph, for their stances on health-care and tax issues. The group has aired an estimated total of $261,000 in broadcast ads. From the other side of the political spectrum, the Iowa-based American Future Fund, has praised Upton and U.S. Rep. Tim Walberg, a Republican from Tipton, for their stances on internet privacy. 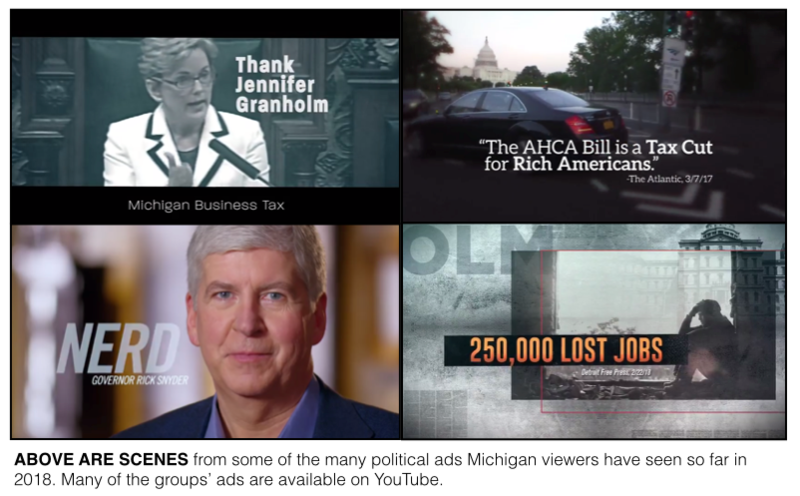 The group has aired about $111,000 in broadcast ads in Michigan so far. According to the Center for Responsive Politics, American Future Fund has previously taken money from organizations connected to the Koch family. A third nonprofit, Faithful Conservatives for Michigan, has been airing ads promoting former state Rep. Kevin Daley, a Republican from Lum. Daley is running for the state Senate this year. The group has spent about $83,000 on broadcast TV ads. It’s also aired cable and radio ads. House Energy Chairman Gary Glenn, a Republican from Williams Township, is running against Daley in the Senate race, and Glenn has alleged that the group is being funded by utility companies. Read more about that situation here.